Depends on what I haven't done for a while..... Probably color stranded work, though I also love Bavarian stitch patterns, too. And then I often find myself doing lacy things, so apparently that's important to me as well. And the garment has to flow together, i.e., minimal sewing; though I can do that well enough, I enjoy the challenge of finding ways to *not* use sewing, or to sew/seam in unexpected ways. I want anyone who knits something I designed to feel like they've had fun learning something new. Now I don't do a lot of designing these days that requires size ranges. When I do, it definitely has to dovetail with full repeats of the stitch pattern. If that means each size goes up in 4.6" increments, so be it. And because I'm plus size, I usually get into that range as well. I'm influenced by their work all the time and I love that as well as count on it. I can be intrigued by a well-executed shawl collar and then I like to see if I can put it on an entirely different type of sweater and pull it off in a different stitch Pat and shape it with short rows instead of stair-step cast-ons or bind-offs. If you're familiar with the February Lady Sweater that Pamela Wynne designed based on Elizabeth Zimmermann's Baby sweater in the Feb. chapter of KNITTERS ALMANAC....., well I call the sweater that I designed for myself based on Pamela's sweater my "August Lady's Sweater". Mine is a pullover; Pamela's is a cardigan. Mine is V-neck vs her crew neck. Mine is plain stockinette in the yoke vs her garter. I used a different lace st in the body and sleeves vs hers, and a different gauge, so all the numbers were mine. Oh, and I added a lace collar to mine. About the only things in common were that they were both top-down raglans. But I hadn't even considered doing mine until I saw hers. Funny, the path that a design can take you. Now I'm not planning at this point to write up/sell that design, but I have no fear that it is its own independent design and if the opportunity present itself where it would be a good fit, then I wouldn't hesitate to use it. That seems strangely funny to me. I have always designed, ever since I learned how to knit. Things kind of fell into place for me to submit some of those designs some 20 years ago, so a formal business plan was the farthest thing from my mind. I never planned to make it a full-time job and I still don't. Teaching knitting has proven more lucrative for me and is where I spend more of my time and energy but I still love designing, probably *because* I don't do it full time. I think it would become very old very fast if I had to devote all my energy to it, and so would teaching, if I had to do it full time. But sticking to a moderate schedule and adding in an occasional design project when and as the spirit moves me keeps it challenging in a fun way. I suppose I have a bit of a "mental" business plan, and that's as formal as it's every going to get. I consider the late Elizabeth Zimmermann as my knitting mentor. I had the great honor to get to know her over about a 10 year period when I attended Knitting Camps from 1979 to 1988 when she was presiding over them. I loved her knitting techniques and her creativity in construction. The "show & tells" we students had was an incredible experience, seeing how some took her techniques and developed them further. I think we loved the challenge of bringing back things that made each other as well as her go "wow!" It was an incredibly rich learning environment brought about by her kind encouragement and enthusiasm. She challenged me several times to send my designs into magazines and it was at her Camps that I first met some of the XRX/Knitters Magazine editors and showed them my work. Other knitters I met at Camp were also making their way into professional work including Sidna Farley who started teaching at TKGA. She kept bugging me to submit proposals to them until I did, and was accepted. Then XRX started the Stitches conventions, so I found out about submitting for them and started teaching for those as well which I continue to this day. Both of those national stages led to being asked to teach for local guilds and shops across the US and even on cruises; I average about one teaching trip per month. Gosh, do you think that there could have been one that was even remotely like what I'm doing? It's led me to more teaching gigs as some sponsors have gotten to know me from my posting "tech answers" on the KnitLIst and KnitU and lots of other Yahoo, etc. knitting lists. I've been active on Ravelry in a similar capacity for nearly 2 years now; while I haven't heard of any specific tie-ins to getting gigs because of my postings there, I'd like to think it doesn't hurt, plus it's great mental exercise to try to decipher what someone is describing, coming up with and explaining a solution in easy-to-understand terms, since many profess to be beginning knitters and may not yet have the vocabulary to comprehend lots of knitting abbreviations or "shorthand" terms. I've not sold patterns on the Internet, but there have been Internet-based KALs of some of my designs which has probably spread the word about them. I don't self-publish, so generally my work is tech edited by the publisher or a TE of their choice. I have an easier time now than in earlier years. I'm retired from my other career (nursing) a few years ago and my sons are grown and out of the house. I'm learning to cut back on commitments for both teaching and designing to keep a sane balance as I don't like my life when it gets too overwhelming. I used to worry that if I turned down a project or gig I might not get another chance. But that hasn't proven to be the case as of yet. I try to be a grown-up about it, reading through evaluations; if there are some common suggestions, that's a pretty good indication to take another look at that particular aspect and see if I can come up with another way to improve things. But I also realize that I can't be all things to all people. If I've honestly tried my best and someone still decides to be unhappy about something, that's their decision. Occasionally I get a complaint that is just plain ridiculous. That's when I'm grateful that I can laugh at the absurdity and try to put that into the "mental erase" file. That was never my goal and fortunately it didn't have to be. The nursing and my husband were there for paying the bills. The knitting pays for itself and the extras in my life. Assess your strengths and weaknesses. Become as technically proficient as you can. Plan to always learn something new. Study the ethnic traditions; they have much to teach. Try to put something unique in each design and/or in each new class. Joan has added some notes here about her gorgeous Kauni Cardigan - not published. Backdrop - Yale Campus, New Haven, CT. This sweater is probably my most complex to date. It has in-the-round shoulder shaping, garter borders integrated into the color stitch pattern, set-in sleeves, sleeve shaping at top/in center. 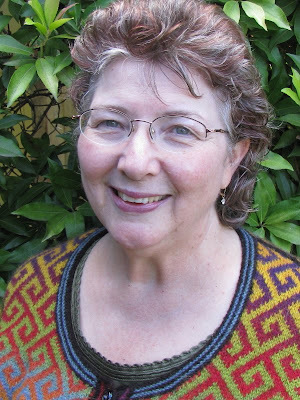 I've enjoyed many of Joan's classes, on an Alaska cruise, at Stitches West and at Madrona (Tacoma WA). She always gives us much more than the subject class, her knowledge is vast and she has a great teaching style. Thank you for this interview. I have been a reader/participant in many of the Ravelry converstions that Jpan has been in on (my that's an awkward sentence structure!) and I have always been impressed by her gentle yet sure voice. She really knows her knitting and is generous in her sharing of that knowledge. Joan has generously helped me on the Ravelry forums when I have come unstuck. When you have no one in your immediate circle to turn to, this kind of help is invaluable. Thanks Joan! 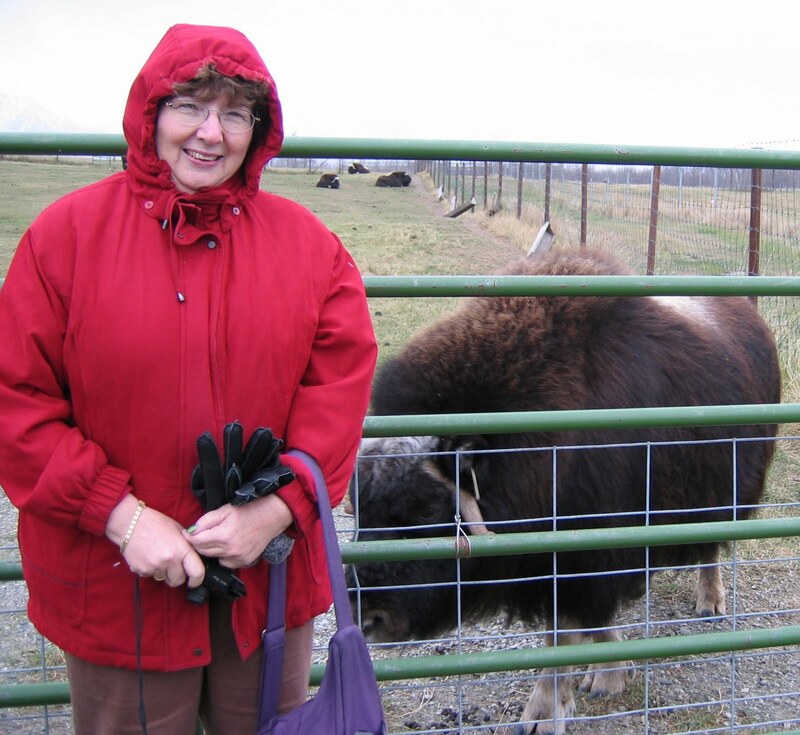 My mother Pauline Elizabeth Lischak Paré, made your Oregon Shawl. She was so proud of it and so we used a photo of her wearing her shawl on the Memory Card and Funeral Program. She was Ukrainian and her father taught her to knit when she was 5 yrs old. There wasn't much that she didn't knit. Now my sister Paulette carries on that tradition. I'd love to send you the photo of her in the Oregon Shawl but don't know how to do that on this blog page. If you'd like to receive it you can email me @ LMPARE849@aol.com and I'll send it as an attachment. My area of specialization is Women's Spirituality so I was most intrigued by the patterns you created in your Oregon Shawl. I was also born and raised here in Southern Oregon so deeply appreciate the power of those patterns and their deeper symbology. I currently live in Ashland, OR and my mother lived outside Grants Pass @ 7016 New Hope Rd, 3 miles from Murphy. We still have the land which is where I was raised. Your work meant a lot to Momma and I'm so happy that I found this blog to communicate with you. Thank you for your incredible designs especially the Oregon Shawl. We displayed the one Momma made on the "memory altar" so that everyone who came to the funeral could see and appreciate the work. Momma brought forth all things from within her body: 8 children, thousands of quarts of canned food, huge batches of bread—a dozen loaves at a time—and, of course, her knitting. 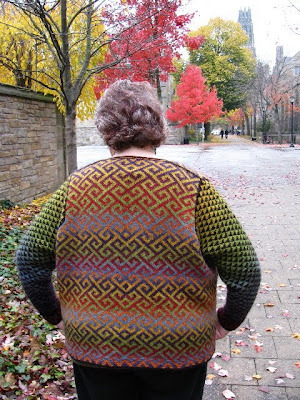 There really wasn’t anything she didn’t knit. The increasing complexity of her work reflected the increasing complexity of her consciousness. Her ability to focus on these complex patterns in the midst of the ongoing chaos of her large complicated family revealed to me a deeply evolved spiritual presence. 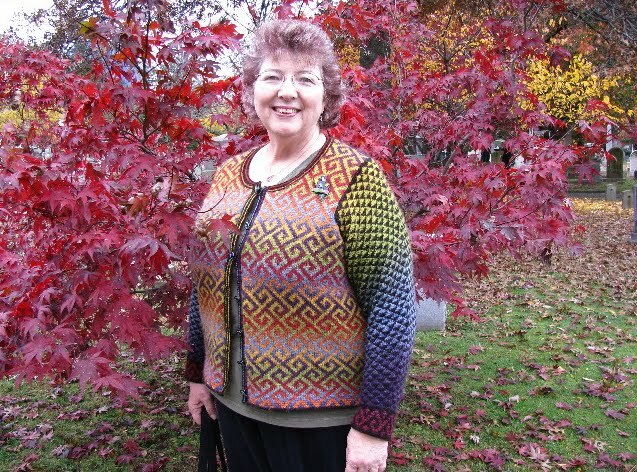 Joan, thank you for your beautiful work and I thank you for the pleasure my mother found in both creating and wearing her Oregon Shawl. I'll send Joan a note so she will be sure to see your comment.